Bouquets and cut flower arrangements are wonderful gifts, but a live plant that will provide greenery for years to come is another beautiful sentiment. I love getting succulents as gifts and I'm returning the favor this year with some home grown succulent babies. This year I had the idea to pot them up in some beautiful mid century modern-looking pottery I bought from Mud and Thread. Step 1) If there's room (my planters are only 2 to 4 inches tall!) line the bottom of your planter with the gravel. This is a reservoir that can hold a little bit of extra water to protect your desert dwelling plant's roots from rotting from too much water. 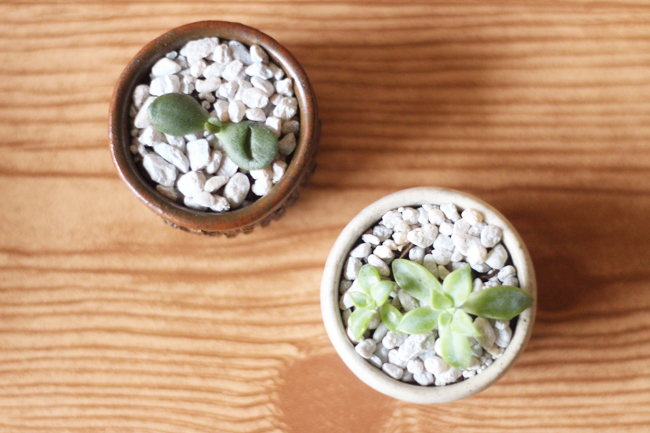 Step 2) Add some soil and plant your succulents in an appealing composition. Step 3) Top with your white gravel. This really completes the arrangement and makes it look polished in my little ceramic planters! 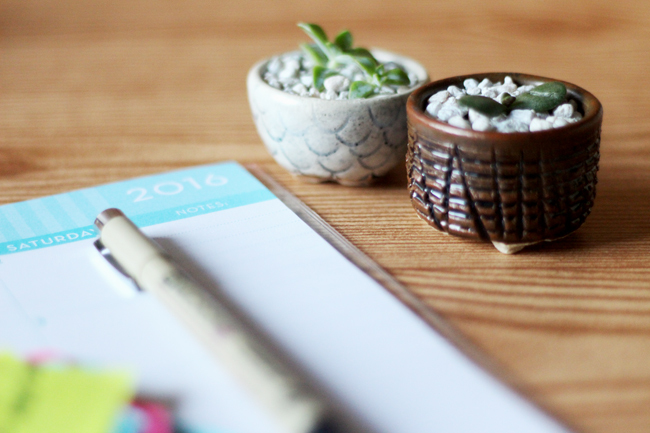 Step 4) Gingerly water your freshly planted succulents. I included the dropper here because that's an easy way to slowly water your tiny arrangements without drowning them! But you can also go slow with a small spouted watering can or use a slow trickle from your sink. 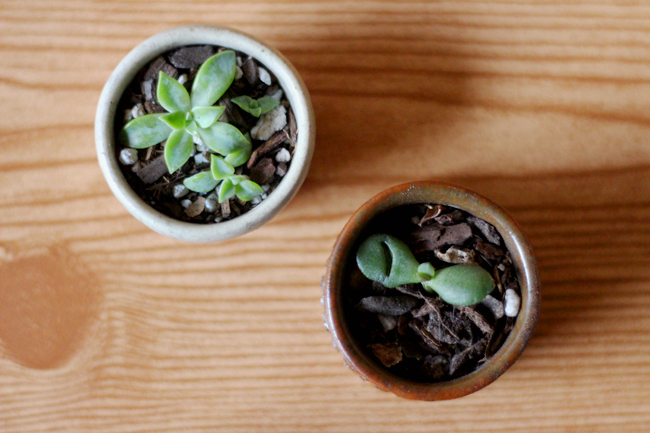 Growing Tips: After your plant has its good soak after transplanting, only water your succulent when the soil is completely bone dry. You can stick a toothpick into the soil to check. Make sure they have good air flow and plenty of sun. Rotate them if you're growing them indoors so they don't get leggy. I love being able to gift home grown goodies to friends and family. 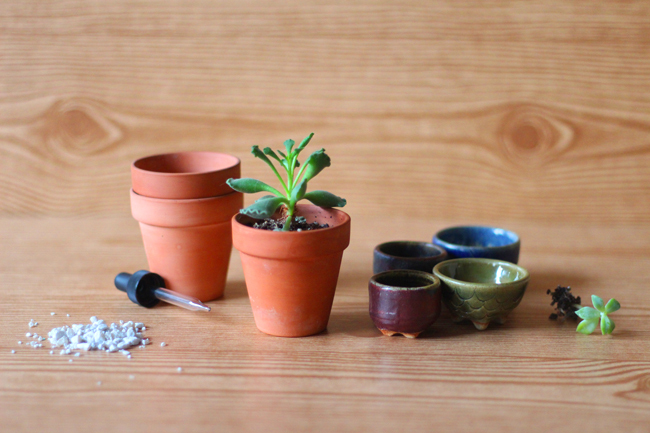 I'm enjoying keeping the little pots on my desk. I'm nursing the little injured jade plant piece there and hope to see him grow into a mighty plant over the years (he's the last piece of a plant I had that died). If you're trying to think of a plant that would look especially good in this type of mod clay pottery I love the look of lithops, or "living stones" as they're known. They carry them at Lowes and Home Depot if a local nursery near you doesn't have them. 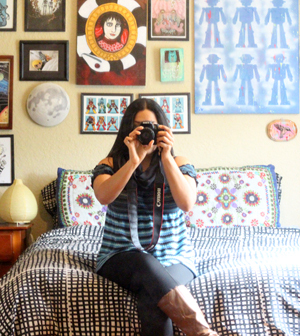 Have you already gotten started on your holiday gift buying and making? 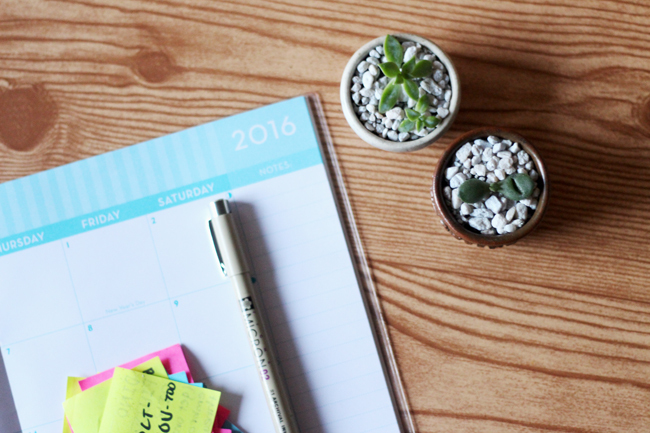 I'll have simple DIY ideas all up for my fellow procrastinators! I love how they grow like crazy here, they're handy plants for skin care or for eating! Do eeet :) I loooved these little art planters. They were only $2 - $5 locally! So cute!! I actually just picked up a crafting book featuring mini-art projects and something similar to these was in it! I think they're adorable. Well done!